Designed by Ludwig Mies van der Rohe, this building was made between the years 1886-1989. It opened as the German National Pavilion for the Barcelona International exhibition in the year 1929. The history of this Pavilion is very interesting. It was made to house the King of that time who sat with the German Authorities. The old building closed down for a while and reopened in the year 1986. 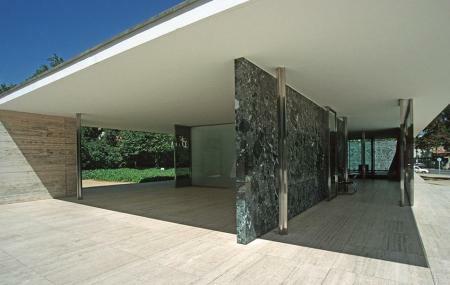 It is a lovely attraction to visit, specially to witness the work of the celebrated artists Ludwig Mies Van DerRohe. For group of 20 people and above, prior appointment is required. For customized tours, prior appointment is required. Payments need to be made in cash at the entrance to the pavilion. The pavilion may occasionally be closed for public access. So check the official website before visiting the place. For discounts, group tickets and special tour tickets: Visit the official website. How popular is El Paballon De Barcelona? People normally club together Parc De Joan Miro and Casa Amatller while planning their visit to El Paballon De Barcelona. Lovely spot. Even cooler when you find out the history behind the place. It was the German pavilion for the 1929 International exposition in Barcelona. Great location too so its worth having a look round it. Not far from the main train station and right beside the Magic Fountain. Amazing Architecture. The details are breathtaking. The place has a very peaceful ambience. If you studied or practice architecture, this is a must visit if course. The Pavilion by Mies van der Rohe albeit rebuilt is breathtaking. Beautiful example of modernist architecture. Even if you don't know the significance of the building it is a great visit early in the morning. Not many people around and there's a sense of serenity between building and outside space which was one of Mies's design ideas. If you're into the Modernism of Mies, this is a must in Barcelona. I was somewhat worried that, since this is a reconstruction, something would be lost. Maybe so, but the airy volumes and rich materials are so consuming that it doesn't matter. Also, the gift shop is fantastic! This icon of Bauhaus style still surprises by its sober beauty. If it seem less radical today than 90 years ago, that's because it was one of only a few buildings which redefined what architecture was all about.